We’ve developed several charts to help you better identify the best tool for your application. 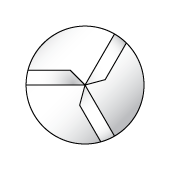 These charts are designed to assist you in the tool selection but keep in mind that factors such as material hardness, Toolholder TIR, workholding rigidity and many other factors can have an impact on tool performance. We’ve used the ISO 513 color coding system that you're already familiar with, and used on carbide inserts, to help you find the best tool based upon the material you're cutting. You can look for these codes throughout the website and in our catalog. Steels (blue) all kinds of steel and cast steel, except rustproof steel with austenitic microstructure. A number of industry terms are used below. Some terms are interchangeable with others and are indicated by the “a.k.a.” Items in BOLD are the standards used in the formulas. 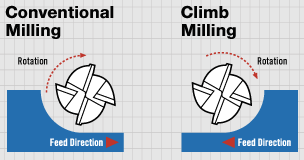 Destiny recommends Climb Milling (as opposed to Conventional Milling) for most applications (assuming back-lash control in the machine). 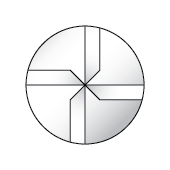 Climb Milling generally allows better flute engagement in the material, resulting in more efficient machining and superior part finishes. 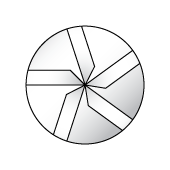 Conventional Milling can lead to work hardening in some ferrous materials.